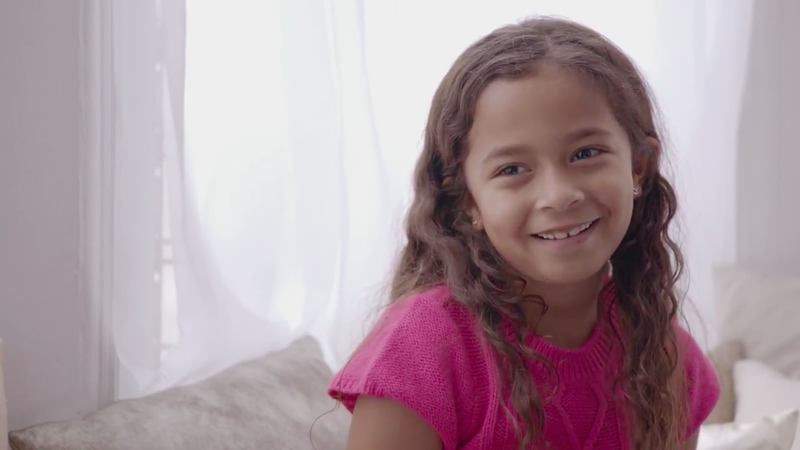 Dove's newest film, from Ogilvy & Mather in Paris, continues the brand's messaging of real beauty and loving oneself, but to a new crowd—girls and women with curly hair. Dove Hair: Love Your Curls starts with the claim, based on research, that only 4 out of 10 curly haired girls think their hair is beautiful. Young girls are then interviewed, declaring that straight hair is more beautiful. Carina, 6, tugs at a blond curl and says, "I try to make it straight by going like this, and it doesn't work." Copy flashes across the screen: "The best way to change how they feel about their curls is to show them how you feel about yours." The spot continues with the girls' friends and relatives, all sporting their curly hair, walking with them down a road. The music picks up, culminating in a song-and-dance party. "We all love our curls" is sung repeatedly like a summer camp anthem. The screen flashes curly hair and bright smiles—the ones from the little girls, in particular, make for a feel-good and heartwarming scene. Rob Candelino, vp of marketing for haircare at Unilever, spoke about the new film in an interview with Adweek. "The Dove Hair: Love Your Curls film reveals an important issue, and Dove Hair has a responsibility to take that finding and instigate positive social change," he said. "One of our most profound research findings was that girls with curly hair are seven times more likely to love their curls if those around them do—this proves we can help make an impact by encouraging women to love and embrace their curls, setting a positive example for girls in their lives." Quite a few black girls and women with natural hair are featured in the spot, so I asked Candelino if he thought that made a particular statement about the discussion regarding natural hair versus relaxed hair in the black community—or women who relax their hair or their children's hair. "The Dove Hair: Love Your Curls campaign was crafted with an emphasis on encouraging all women to embrace their individual curl type and texture, regardless of race or ethnicity," he said. "Beauty, confidence and self-esteem are wide and far-reaching topics. Dove believes that every woman has the opportunity to make a difference in a girl's life and have a positive impact on her self-confidence. The Dove Hair: Love Your Curls campaign is intended to motivate and inspire all women and girls with curls." I told him that people sometimes love and hate the Dove campaigns, and asked him how he responds to critics who say Dove bases its work around people's insecurities. "Dove is first and foremost a beauty brand, but we are different," he said. "We are a proud leader in redefining how beauty is portrayed and celebrated, and we have been committed to helping make beauty a source of confidence, not anxiety. Building on the scale of the Dove brand, the Dove Hair: Love Your Curls campaign reveals the opportunity that all women have to set a positive tone for the next generation. It illustrates how important it is for curly haired women to show the love they have for their beautiful, natural curls so they can pass that sentiment along to other curly girls in their lives." While Dove says only four out of 10 curly haired girls think their hair is beautiful, I'm wondering what the statistics are for girls without curls. My 6-year-old with pin straight hair, for example, has often wished hers was curly—or more wavy, like mine. Also, I won't let the knowledge that every straight-haired girl I know owns a curling iron (Candelino mentioned that "straight and sleek hair is the traditional beauty ideal," but I don't know if I buy that) or that curly haired women don't necessarily produce curly haired daughters trump the feel-good feelings of the spot, as the little girls dance and smile and the women in their lives declare them "perfect this way." "The final scene reveals what our research confirmed and what Dove has passionately championed for years—whether a mother, mentor, teacher, aunt or even friend—women can influence and inspire young girls in their lives," said Candelino.